Happy fair use week! I’m sure many of you have already taken note that February 20 to 24 is a week-long celebration of copyright’s fair use doctrine. The organizers at fairuseweek.org have done a great job collecting information about events and sharing resources. This ARL-commissioned fair use myths infographic is among my favorites. One of the things I plan to do this week is talk about how important fair use is for authors. Duke, like many universities, is home to thousands of faculty and student authors who produce a tremendous quantity of creative work. 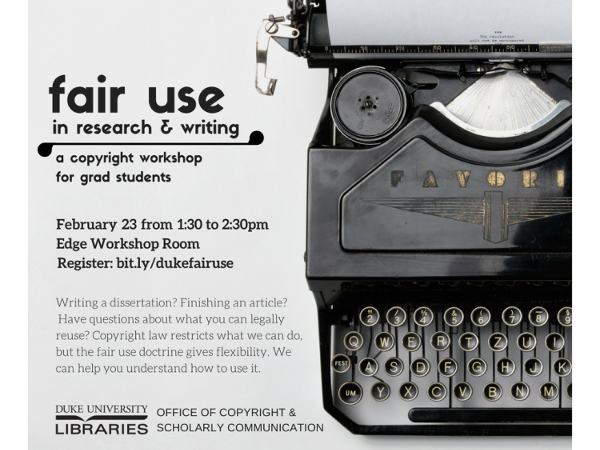 In support of them, on February 23, the Duke University Libraries Office of Copyright & Scholarly Communication will host a workshop for graduate student authors who have questions about fair use in writing their dissertations and for other writing projects. If you’re at Duke and interested, we invite you to click the link above and register! “[T]he author’s consent to a reasonable use of his copyrighted works ha[d] always been implied by the courts as a necessary incident of the constitutional policy of promoting the progress of science and the useful arts, since a prohibition of such use would inhibit subsequent writers from attempting to improve upon prior works and thus . . . frustrate the very ends sought to be attained.” Professor Latman, in a study of the doctrine of fair use commissioned by Congress for the revision effort . . . summarized prior law as turning on the “importance of the material copied or performed from the point of view of the reasonable copyright owner. In other words, would the reasonable copyright owner have consented to the use?” (citations omitted). Reflecting on that quote, sometimes I think our understanding about author perspectives on copyright has been dominated by those who have strong economic interests in the sale of their work. For many years, groups such as the Authors Guild have been vocal advocates for their membership, which includes many trade book authors. But there are many other authors (historically, less vocal) with a different perspective, who create with sharing and readership as their dominant motivation, not making money. That includes many academics. One group, the Authors Alliance (I am a member), has taken up the job of “promot[ing] authorship for the public good by supporting authors who write to be read.” Authors Alliance has been working to give a powerful platform from which the views of these authors, including many academics, can be expressed. One of the issues that Authors Alliance has focused on is the importance of a strong fair use right for authors. A good example comes from an amicus brief that Authors Alliance recently filed in the Georgia State University fair use e-reserves case. That case was initially brought in 2008 against GSU by Cambridge University Press, Oxford University Press and Sage. It’s now on its second appeal before the 11th Circuit Court of Appeals. The case is largely about whether it was permissible under the fair use doctrine for GSU faculty to make excerpts of academic books available to students through the GSU electronic course reserves system. Even though the GSU suit has been ongoing for nearly nine years (! ), as far as I can tell, no one has bothered to give the courts the perspective of the actual authors of the excerpts at issue in that case. In its recent amicus brief, Authors Alliance did just that. In a page and a half of direct quotes, the brief highlights some straightforward but until-now undocumented views of the authors who wrote the chapters and books used by GSU faculty in their classes. These included, for example, quotes like “I want my work to be read as widely as possible. I have no trouble with articles or individual chapters of my book being copied for use in the classroom. In fact, I welcome it.” (Carolyn Ellis, Professor of Communication at University of South Florida and an Authors Alliance member). While the brief does a fantastic job of working through thorny legal questions about the application of copyright law to educational use of academic works, to me the most powerful and persuasive parts of the brief are the statements from authors themselves about what they think should be permissible, and why. I don’t know whether those quotes will leave the same impression on the appellate court, but I am optimistic. So, authors: speak up! Talk about why fair use is important for your own work and how it has helped you. And talk about how you want your work to be used by others, whether in the classroom, in new research and scholarship, or by readers more generally.